Seoul - Temple elections were held for As Salam Temple No. 215, Noble Bruce L. Brown was relected the Eigth Illustrious Potentate of the Temple. 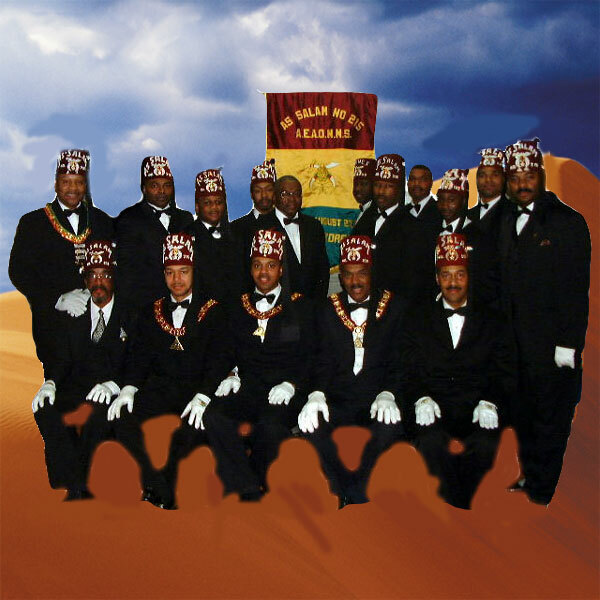 The other elected officers are as follow; Nobles Willie F. Baker IV, Chief Rabban, James E. McCall, Assistant Rabban, Carl L. Webb, High Priest and Prophet, Oriental Guide Noble Reginald Burrus, Noble Treasurer Ishmal Webb and Noble Recorder Tomas R. Hawkins, . Illustrious Potentate Brown and the newly elected and appointed officers bring leadership, commitment and dedication to As Salam Temple. The Divan has already met and they are busy trying putting the Temple on a solid foundation. Upon assuming the privilege and challenge in becoming Illustrious Potentate, I am announcing to the divan and temple several goals or thrusts that we will pursue in the interest of Shrinedom. These goals/thrusts will be arrived during the year by this divan. Along with my own observations and direct experiences, there have been long discussions that Ive engaged in with Nobles from across the Oasis; young nobles, middle age nobles, the more senior nobles, and others, have pleaded for the leadership of Shrinedom to give them something uplifting about which they could applaud and be proud of. This I believe was the basic focus of the five- (5) thrusts that I am submitting to this Divan for action! Reclaiming at least 25 nobles and creating more Nobles October of 2002. Impacting the social, political, academic, economic, moral, and cultural order at the local, [desert] national and international levels through aggressive and responsible programs. Each member of this divan will submit in writing their report to this temple in May 2002 on what they have done to reach or accomplished these goals. Noble, here listed below is OUR TEMPLE'S Scheduled Meetings and other Calendar of Events for your information and attention. Nobles, the dates for the meetings are confirmed, but the other Calendar of Events are "PROPOSED" for 2002. Scores of Men join our ranks under the impression that they have been given a license to play. Please be advised that the work of Charity, Benevolence, and Service to Allah claim our full attention. "All work and no play make Jack a dull boy". "All play and no work, No Jack". Only men who have learned well the lesson of Temperance, Fortitude, Justice, and Morality, has a place in Shrinedom. HUMANITARIANISM: EACH YEAR THE SHRINERS BUDGET FUNDS FOR THE HEALTH AND MEDICAL RESEARCH DEPARTMENT, AND THE VARIOUS HOSPITALS AROUND THE COUNTRY INVOLVED IN, RESEARCH ON HYPERTENSION (HIGH BLOOD PRESSURE) CANCER RESEARCH, SICKLE CELL, LUNG DISEASES, AND AIDS RESEARCH. EDUCATION: THE STUDENT AID PROGRAM FUNDS EDUCATIONAL SCHOLARSHIPS TO SCHOOLS SELECTED BY THE RECIPIENTS (SCHOOL OF THEIR CHOICE); IN ADDITION TO THE TALENT AND SCHOLARSHIP PAGEANT, WHEREIN FEMALE STUDENTS COMPETE AND WINNERS AWARDED SCHOLARSHIPS TO THE SCHOOL OF THEIR CHOICE. PREP PROGRAM: DESIGNED AND FUNDED TO ASSIST HIGH SCHOOL STUDENTS TO IMPROVE THEIR ACT/SAT SCORES, FOR PREPARATION TO ENTER HIGHER INSTITUTIONS OF LEARNING. U.N.C.F. : BUDGET FUNDED TO AID HISTORICALLY BLACK COLLEGES/UNIVERSITIES TO ASSIST STUDENTS IN ATTENDING SCHOOL, AND CONTINUING THEIR EDUCATION. .VOTERS REGISTRATION/EDUCATION: THE TOTAL SHRINE PURPOSE IS TO BE INFORMATIVE AND REACHOUT TO PEOPLE UNAWARE OF THE IMPORTANCE OF VOTING, THEREBY EXPRESSING THEMSELVES WITHOUT FEAR OF REPRISALS ON ISSUES LOCAL OR NATIONAL THAT NEED ADDRESSING. NAACP: A BUDGETED PROGRAM THE SHRINERS CONTRIBUTE MONEY TO AID THE NAACP IN THEIR STRUGGLE TO ALLOW MINORITIES THE SAME PRIVILEDGES AND FREEDOMS, PROVIDED BY THE UNITED STATES CONSTITUTION AND BILL OF RIGHTS. THIS INCLUDES LEGAL DEFENSE FUNDS FOR FIGHTING THE BATTLES IN THE COURTS OF AMERICA TO PROTECT OR IMPROVE THOSE RIGHTS ALREADY INHERENTED TO ALL U.S. CITIZENS. FELLOWSHIP: AS A FRATERNAL ORGANIZATION PART OF FREEMASONRY, THE SHRINERS ARE DEDICATED TO MASONIC PRINCIPLES. YOU CAN WIDEN YOUR CIRCLE OF FELLOWSHIP AND OFFER COMERADERY AMONGST MEN WITH SIMILAR TASTES, INTEREST, AND ASSOCIATION WITH MEN WHO ARE LEADERS IN ALL WALKS OF LIFE. TEMPLES MAY BE FOUND IN CANADA, U.S.A., GERMANY, ENGLAND, SPAIN, PANAMA, PHILIPPINES, OKINAWA, BAHAMAS, AND THAILAND, IN ADDITION TO SHRINE CLUBS. FUN: SHRINERS ARE MEN WHO ENJOY LIFE. THEY ENJOY PARADES, TRIPS, DANCES, DINNER, SPORTING AND COMPETITIVE EVENTS. YOUR TEMPLE PROVIDES EVENTS TO FIT EVERYONE'S TASTE. WHERE TO LOOK: THERE ARE POTENTIAL SHRINERS ALL AROUND YOU EVERY DAY. THEY'RE JUST WAITING FOR YOU TO ASK THEM TO JOIN-IN YOUR CHURCH, ALL YOU MASONIC GROUPS, YOU NEIGHBORS, YOUR FRIENDS, IN YOUR CIVIC CLUBS AND GROUPS, AMONG YOUR BUSINESS ASSOCIATES, AND YOUR RELATIVES. TOOLS NEEDED TO HELP: BE CERTAIN YOU HAVE PETITIONS FOR MEMBERSHIP. THE PHAMPLETS ON THE "SHRINE" PUBLISHED BY THE IMPERIAL COUNCIL. "The Playhouse of a Man's Mind is a place of hard work". "A Noble is free to be right because it is right". "Overall let us live, work, and play so that Allah shall find delight in us". The temple is requesting that all Officers and Nobles TO PAY YOUR 2002 DUES NOW! The Semi-annual report is due January 15, and July 15 of every year. The Temple has paid half of its Per Capita Tax. Nobles, Per Capita Tax are due on or before July 15 of each year. The Temple shall pay half increments with the semi-annual or annual reports. Regardless of the payment method elected all taxes must be paid on or before July 15. Nobles please take notice of our financial obligations and let's pay our dues NOW! We have 2002 dues cards on hand. Creations... Creations will be of the 4th Saturday of June and October of 2002. All Nobles should pick up petitions and make sure candidates have their Physicals. Nobles please get your petitions in as soon as possible. We need candidates and petitions NOW! Be sure that your candidates get his physical done before submitting the petition to the temple for voting. We also need a deposit of $ 150.00 with the petition and Nobles please sign the petition if you recommend the novice. Nobles we also need your current address and permanent home address in the states. If any noble knows the address of a noble of this Temple, please contact the Noble Recorder. This will help us to get your Pyramid. If your address is not current, we cannot communicate with you. We are asking all Officers and Nobles to participate and provide input to the Temple's quarterly Newsletter. We are looking for articles on your shrine clubs, noteworthy news, and information and articles concerning Shrinedom. Submit consolidated input on hard copy and disk in the Microftsoft Word format. In addition provide a current list of shrine club officers and phone numbers. For further information please contact the recorder. Dead lines for submission to the quarterly newsletter are: the 12th of April, July, and October! Or just masking a plan of your evil to start, Being one of the many ready to rally for good, Instead of waiting always wishing you could. Congratulations to our new nobles! As Salam Temple held a Creation in April 2002, 16 Novices crossed the sands of the desert into Shrinedom. Creation held on 22 July 2002, 9 Novices were made Nobles of the Mystic Shrine. Not only just Dr. Martin Luther King, Jr., but all the Americans of African Descent that have contributed to the qualities of life that people of all races enjoy from day to day. The theme for this year is "The Promises of a better tomorrow through understanding" Charity, Duty, Action; A Day On not a Day Off"